With Flores in the rear-view mirror, it was time to head west. 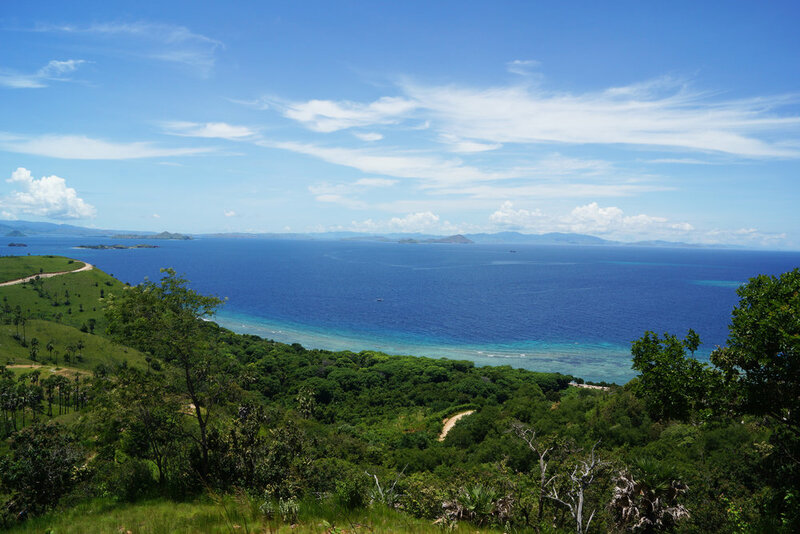 Labuanbajo is the gateway to Komodo National Park, and was our final destination on Flores. The town itself is somewhat uninspired: its dusty and utilitarian - a hub and a base for those seeking the greener pastures of one of the world’s most famous nature reserves. Views from the outskirts of Labuanbajo. But, despite the rave reviews, I wasn’t here to go to Komodo. And I was eager to keep moving. There are a few options to get from Labuanbajo west towards the tourist havens of Lombok and Bali. Many take the luxurious, expensive 4 day boat cruises, passing through Rinca and Komodo islands, along the north Sumbawa coast, and ending at the highly praised Gili Islands. Others, understandably, opt for the short flight back to Denpasar. My budget and desire to see more, though, pushed me towards the local option: the slow ferry to Sape, Sumbawa - the next large island along the Indonesian archipelago - and onwards overland from Bima, Sumbawa's rarely visited capital. Sami, my fleeting Finnish companion - also wedded to an overland dream - and I woke early, purchased our 60,000 IDR tickets at the Labuanbajo Ferry Terminal (just around the corner from the Fish Markets), and were settled on the enormous passenger boat by 8am. For those considering this option, take note: it is quite uncomfortable. When we arrived, most seats were taken, with the exception of two bench seats next to an old man who managed to smoke a packet of cigarettes throughout the journey just inches from my face. As he peered continuously over my shoulder at my kindle, chin nearly resting on my collar bone, his every puff became one of mine. One of an endless array of islands between Labuanbajo and Sape. While you can move around the ship, there’s not really anywhere to go: the upper deck is entirely exposed and without shade, making it bearable for only a few minutes at a time. And the cabin is so crowded - with people and their produce strewn inelegantly across the floor -there is barely anywhere to stretch your legs. 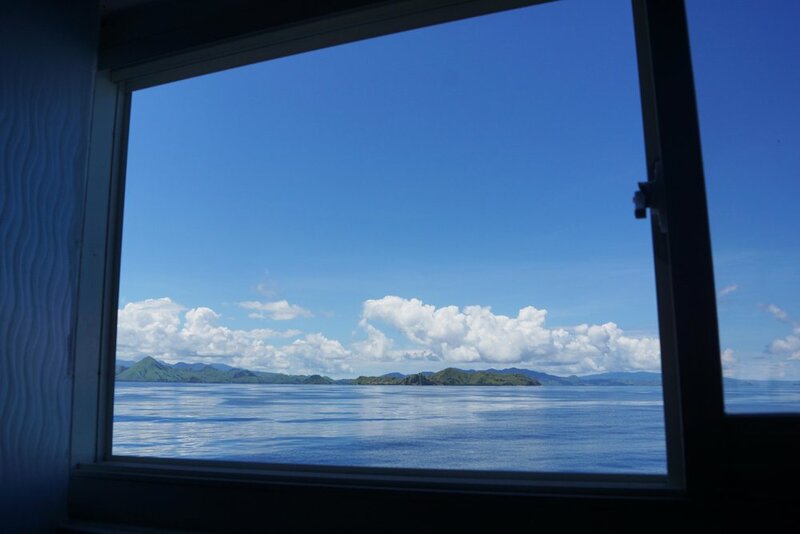 But, despite the displeasures, it is a beautiful ferry ride, passing Komodo National Park and the seemingly endless array of islands that litter the straight between Flores and Sumbawa. I spent much of the journey staring out the open window - the tranquility of the views only interrupted by my elderly seat-neighbour continually throwing his cigarette buds and trash past my face and into the pristine (for the moment) seas. At times, colourful ocean life could be viewed from the window. I saw schools flying fish being chased by a neon-blue, 8 foot long swordfish, racing around the ship for minutes at a time. 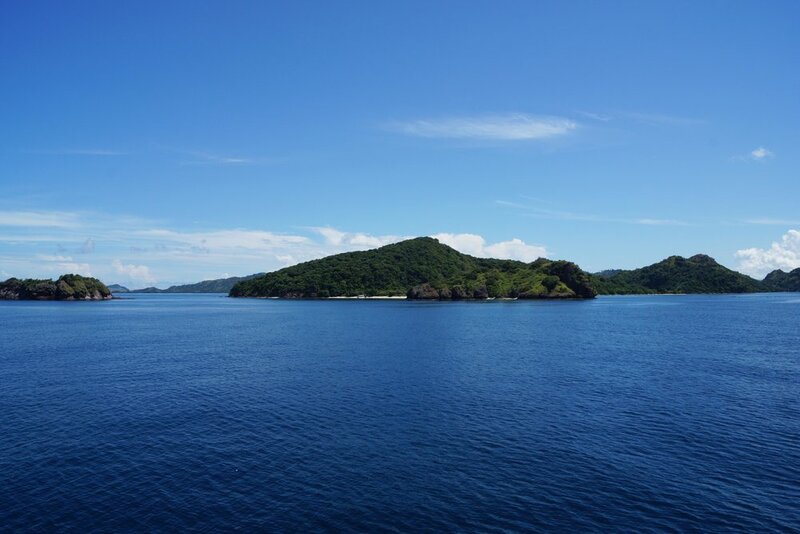 The Labuanbajo-Sape ferry took seven hours, over calm, at times sky-blue seas. Looking back towards Flores from the sunny upper-deck. As the ferry pulled closer the small portside town of Sape and the call-to-prayers grew louder, those wishing to capitalize on the captive, transport-needy passengers prepared to jump the ship. As it docked, they pounced: like pirates in the Malacca, these young entrepreneurs rushed the ferry in their dozens, offering to carry bags, drive passengers to Bima and elsewhere, and do just about anything for a few rupiah. Sami and I instead walked to the small local bus terminal, squeezed in to an overcrowded 40 year old bus, and began the one hour, 25,000 IDR ride to Bima. Lots of people are dismissive of Sumbawa as a destination. But the drive into Bima was charming enough: quaint, if dusty, villages lined the main road between towns, and there were some breathtaking views of large valleys and rice paddies for the 90 minute skip across to the regional capital. I began to regret my decision to transit through the island in one fell swoop. We arrived at dusk. 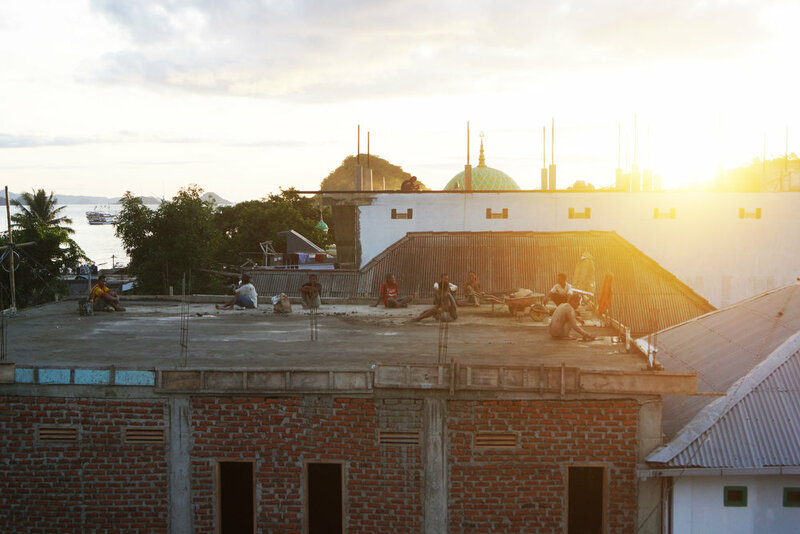 Bima is a city not known for its appeal. 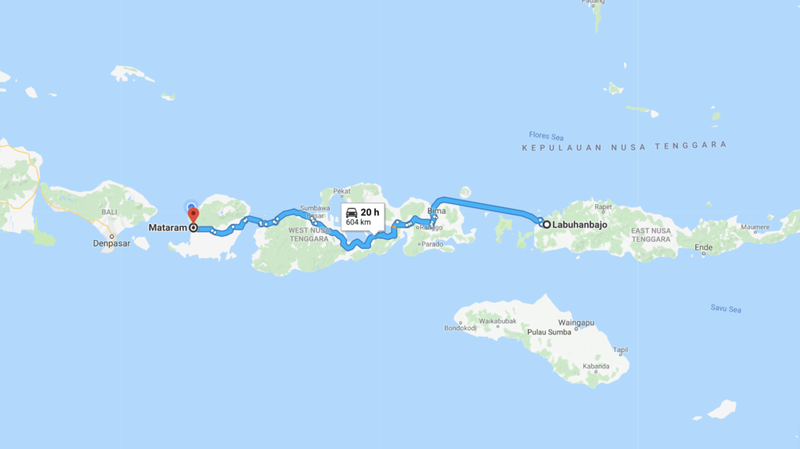 And, considering we had no real intention of sticking around this part of Sumbawa, we were happy to be informed there was a bus that would travel through the night, all the way to Mataram, Lombok. I wanted to see some of Sumbawa, but only its western shores, where some of Indonesia’s best-kept secret surf and snorkeling spots are to be found. But from Mataram, I rationalised, western Sumbawa is just a short motorbike ride away. And for just 200,000 IDR, the promise of an easy crossing of the island was too hard to resist. We bought our tickets, scoffed down the best $1 street-side Mie Goreng I’ve had in Indonesia (and granted the chef a selfie with two of the only bules he would have served for a while), squeezed on board, and settled in for a sweaty, dangerously fast over night ride across the island. This was, undoubtedly, the most uncomfortable 8 hours of the trip so far. The much-touted air conditioning didn’t really work, manifesting itself as small, inconsistent drips of luke-warm liquid onto my forehead throughout the ride. We were sweating - and too close to the onboard bathroom for comfort. The seats were larger than local buses, but only marginally so. Plus, the driver was a madman. I’d read that morning about 18 people being killed in a Hong Kong commuter bus crash. And here I was, speeding through a rainy night with 60 others and dozens of bags of potatoes, through rural Indonesia. Suffice to say, my stomach sank at every rapidly approaching corner. My only comfort was the escapism offered by the gossip-laden Fire and Fury, which distracted me from the upcoming catastrophe. At 3am, we were unceremoniously booted off the bus at Poto Tano, on Sumbawa's west coast, and marched single-file on to the open-air deck on a Pelni ferry. The hour long crossing was forgettable: cold wind blew in from the open sea, local buskers - not reading the exhausted audience - strummed out of tune guitars and sang painfully loud. Their bounty that night was abysmal. It was on this ferry I got my only real sleep that night. Sprawled out over the bench seats, I closed my eyes, and let the gentle early-morning swells rock me into a shallow, 30 minute slumber. The sun broke was we landed on Lombok, headed to the lower deck of the ferry and re-boarded our sweaty bus. By now, I was deliriously tired, and began to wear the smells that linger in an over-capacity coach with the heat too high. Drifting in and out of consciousness, we arrived in Mataram - a surprisingly pretty, clean city by Indonesian standards - by 8am, just a few hours after landing on the island. Exhausted, we were satisfied: we’d made it from Labuanbajo to Mataram, over land and sea for just 290,000 IDR, or US$21. It was, despite the discomforts, a worthwhile option for those wishing to rough it like the locals as you island-hop the vast Indonesian archipelago.